Monday night the movie, ‘Truck Farm’ presented by Whole Foods is about people in New York who wanted a garden in New York City and didn’t have a place to put one so they planted it in the back of a truck! Afterwards Homegrown New Mexico will have a panel discussion on community gardening. Come see our own ‘truck farm’ which will be on display at the movie. 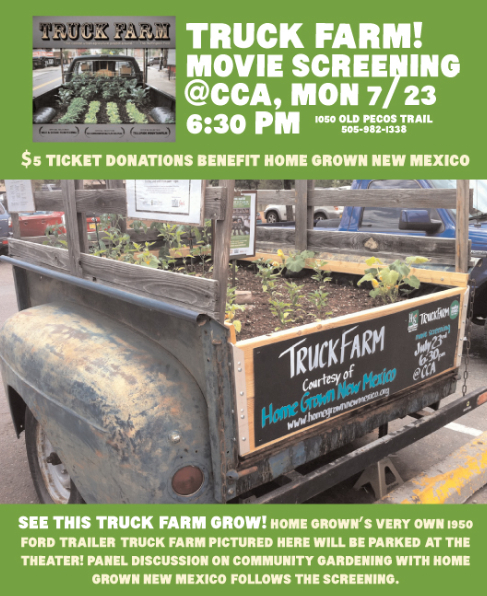 This entry was posted in COMMUNITY ORGANIZATIONS, HomegrownNewMexico and tagged Homegrown New Mexico, truck farming, vegetable gardening. So this is a real thing!? I read about a similar project in Milan recently (http://www.smart-urban-stage.com/blog/future-of-the-city/crowded-cities/), which looks a bit sleeker, maybe, but otherwise serves the same purpose. I do think the inclusion of streetlights and Wifi hotspot (to unclog the air of Wifi waves…) is a neat aspect. Seems to make so much sense, too, for urban areas lacking in any kind of open area (that could potentially be reclaimed for gardening, for example). Cool stuff!